LANSING — Six statewide campaigns seeking to change Michigan law by gathering petition signatures have already combined to raise more than $2.7 million. A majority of that money continues to come from just a handful of sources. While the campaigns are at different phases in the proposal process — some have started collecting signatures; some haven’t — all six efforts had to turn in updated fundraising disclosures last week, covering their fundraising through July 20. Three of the campaigns have received more than $800,000 each in support so far in 2017, according to their reports. The other three are further behind. The Coalition to Regulate Marijuana Like Alcohol, which wants to legalize marijuana in Michigan, has had the most resources: $826,807. Of that total, $518,188 came in the form of direct contributions and $308,619 came in the form of in-kind contributions. In-kind contributions are contributions of goods or services that aid the campaign, like consulting work or a venue for a fundraiser. 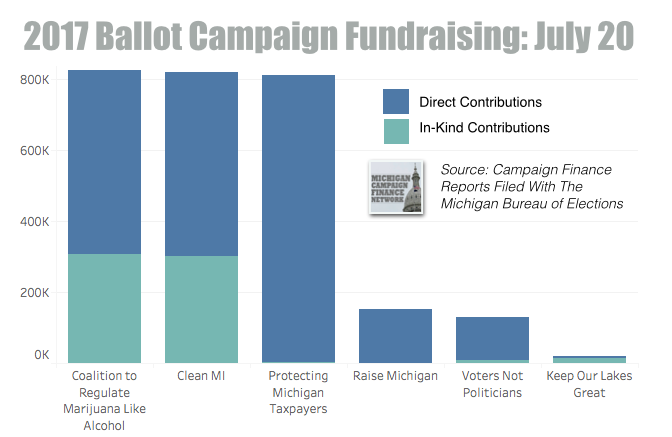 The Clean MI Committee, which wants to institute a part-time Legislature, has attracted $819,113 with $517,889 in direct contributions and $301,224 in in-kind contributions. 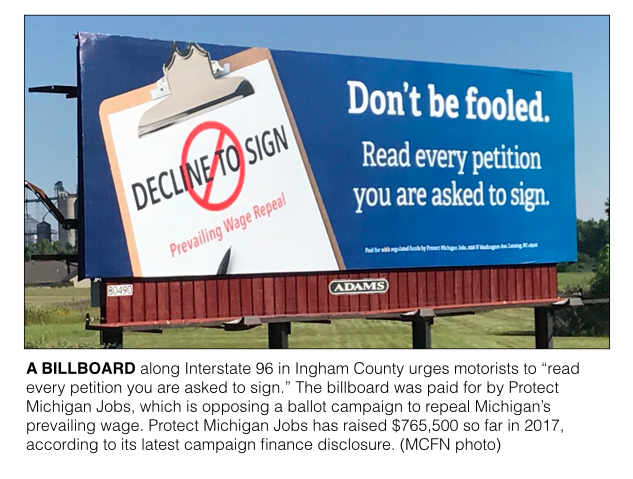 Protecting Michigan Taxpayers, the committee aiming to repeal the state’s prevailing wage which sets wage standards for certain public construction projects, has raised $810,945 with $808,000 in direct contributions and $2,945 in in-kind contributions. Each of the three ballot campaigns leading in fundraising have received heavy backing from one organization in particular. A nonprofit called Fund for Michigan Jobs has helped bankroll the Clean MI Committee, providing $506,000 of the $517,889 in direct contributions the committee has received. For Protecting Michigan Taxpayers, the Associated Builders and Contractors of Michigan has been the primary funder, giving $635,945. Of the six ballot campaigns, Voters Not Politicians, the campaign to reform the state’s redistricting process, has the broadest donor base. The committee has reported 2,080 direct contributions. No other committee has reported more than 160 individual contributions so far. According to the state, groups looking to amend the Constitution have to collect 315,654 valid signatures in a window of 180 days to get on the ballot in 2018. Groups looking to create or amend legislation — not the Constitution — have to collect 252,523 valid signatures to get their proposals before the Legislature, which could send them to the ballot. Of the six groups tracked here, Voters Not Politicians and Clean MI Committee are the two trying to amend the Constitution. The four others are attempting to initiate legislation, according to their petitions. The following is a summary of where fundraising stands with the six ballot campaigns for 2017. Subtracting the spending total from the direct contribution total doesn't alway equal the money available total because some committees had funds on hand before 2017.